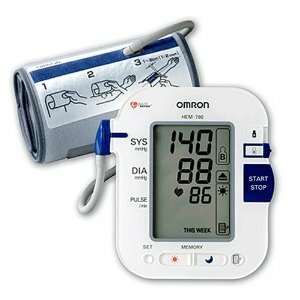 The Omron HEM-780 Automatic Blood Pressure Monitor with ComFit Cuff is one of the most effective units available today. It takes only seconds to receive an accurate reading that will improve your health awareness. This is a safe and easy way to manage your blood pressure. To operate, you simply wrap the cuff around you arm and press start. This is perfect for elderly patients who can apply the cuff without any assistance. Most importantly, it has been approved for detecting morning hypertension. This is a great way to improve your quality of life. One of its most redeeming features is the ComFit Cuff. This cuff is pre-formed for a quick and proper fit every single time. It works perfectly and is designed for medium to large-sized arms. This is just one of the ways that Omron makes your life easier. In addition, the Omron HEM-780 Automatic Blood Pressure Monitor is equipped with IntelliSense. This feature automatically inflates the cuff to the ideal level. There are simply no adjustments needed. This is especially useful for people who are hypertensive or have arrhythmia because their blood pressure is likely to fluctuate. It ensures maximum comfort and optimal performance. This is a clinically proven way to get accurate blood pressure readings. It is a great way to achieve a healthy and active lifestyle. In fact, measurements at the pharmacy are often less accurate because you have been walking around. If you are looking for an easy way to monitor you blood pressure, this is the unit for you.